PONTE VEDRA BEACH, Fla. – Leftover Salmon will jam out at Ponte Vedra Concert Hall, on Nov. 05. They will close out 2015 and begin 2016 with this leg of the tour. The first performance will take place on Sept. 17 at Ardmore Music Hall in Ardmore, Pa. and it will end on Jan. 2 at Crystal Bay Club in Crystal Bay, Nev. They will be promoting their latest album, “High Country”. 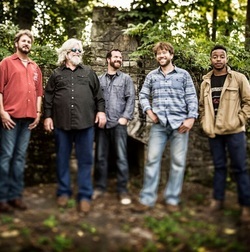 Today, Leftover Salmon is: Vince Herman (vocals, acoustic guitar, washboard); Drew Emmitt (vocals, acoustic and electric mandolin, electric guitar, fiddle); Andy Thorn (vocals, acoustic and electric banjo); Greg Garrison (vocals, acoustic and electric bass); Alwyn Robinson (drums). “High Country” features 12 tracks including: “Get up and Go”, “Western Skies”, “Home Cookin’”, “High Country”, “Bluegrass Pines”, “Better Day”, “Six Feet of Snow”, “So Lonesome”, “Light in the Woods”, “Thornpipe”, “Two Highways” and “Finish Your Beer”. Robinson played drums on “Bluegrass Pines” and “Six Feet of Snow”. José Martinez played drums on the rest. The album, “High Country”, was recorded at Mighty Fine Productions in Denver. It was recorded in March 2013, April 2013 and Feb. 2014. It was produced by Steve Berlin, executive produced by John Joy and engineered by Mario Casilio. “Bluegrass Pines” was produced by Payne, mixed by Casilio and Dave McNair. The rest was mixed and mastered by McNair at Dave McNair Mastering in Houston. The artwork was designed by Gary Houston Design and the layout was by Sara McCormick. Special guests include Steve Berlin (baritone saxophone on “Light In The Woods”, mellotron on “Two Highways”), Sugar Blue (harmonica on “Home Cookin’, “So Lonesome” and “Two Highways”), Kim Dawson (backup vocals on “Light In The Woods”), Casey Driessen (fiddle on “Thornpipe”), Andy Hall (dobro on “Get up and Go”) and Joey Porter (wurlitzer on “Home Cookin’”, Hammond B-3 on “High Country”, Hammond B-3, Yamaha SK50 and toy piano on “Better Day”, Hammond B-3 on “So Lonesome”, Hammond B-3 and Fender Rhodes on “Light In The Woods”, Roland Juno on “Two Highways” and Yamaha SK50 on “Finish Your Beer”). To visit Leftover Salmon’s official website, please click here. To like them on Facebook, please click here. To subscribe to their RSS feed, please click here. To follow them on Twitter, please click here. To subscribe to their channel on YouTube, please click here. Sept. 17 - Ardmore Music Hall, Ardmore, Pa.
Sept. 18 - Brooklyn Bowl, Brooklyn, N.Y.
Sept. 19 - Freshgrass Festival at Mass MoCa, North Adams, Mass. Sept. 20 - MAUCH CHUNK OPERA HOUSE, Jim Thorpe, Pa.
Oct. 02 - Sweetwater Music Hall, Mill Valley, Calif.
Oct. 17 - American Roots Music & Arts Festival at Walnut Creek Amphitheatre, Raleigh, N.C.
Oct. 18 - Hillberry 2 - The Harvest Moon Music Festival at The Farm, Eureka Springs, Ark. Oct. 24 - JEFFERSON THEATER, Charlottesville, Va.
Nov. 04 - Vinyl Music Hall, Pensacola, Fla.
Nov. 05 - Ponte Vedra Concert Hall, Ponte Vedra Beach, Fla.
Nov. 06 - Jannus Live, Saint Petersburg, Fla.
Nov. 07 - Goodwood Museum, Tallahassee, Fla.
Nov. 08 - Plaza Live, Orlando, Fla.
Nov. 27 - Boulder Theater, Boulder, Colo.
Nov. 28 - Boulder Theater, Boulder, Colo.
Dec. 02 - SWYER THEATRE, Albany, N.Y.
Dec. 03 - Higher Ground, Burlington, Vt.
Dec. 04 - Brighton Music Hall, Allston, Mass. Dec. 05 - Wolf Den at Mohegan Sun, Uncasville, Conn.
Dec. 31 - Roseland Theater, Portland, Ore.
Jan. 01 - Crystal Bay Club, Crystal Bay, Nev.
Jan. 02 - Crystal Bay Club, Crystal Bay, Nev.
March 11 - The Stanley Hotel, Estes Park, Colo.
March 12 - The Stanley Hotel, Estes Park, Colo.
March 13 - The Stanley Hotel, Estes Park, Colo.
May 07 - American Theatre, Hampton, Va.